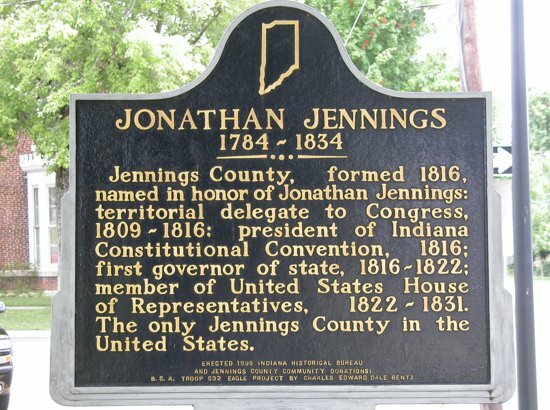 Jennings County formed 1816, named in honor of Jonathan Jennings: territorial Delegate to Congress, 1809-1816; president of Indiana Constitutional Convention, 1816; first governor of state 1816-1822; member of United States House of Representatives, 1822-1831. The only Jennings County in the United States. 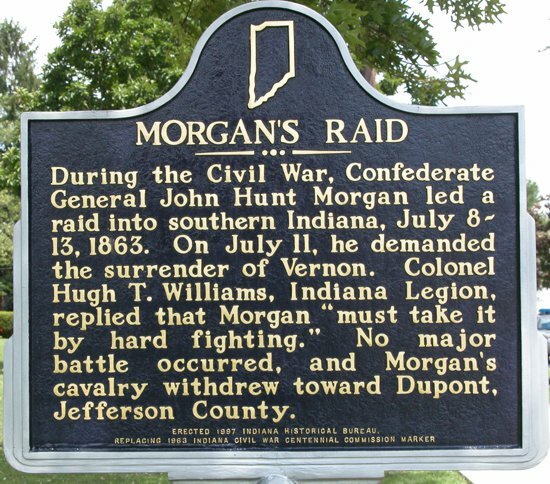 John Hunt Morgan led a raid into southern Indiana July 8-13, 1863. On July 11, he demanded the surrender of Vernon. Colonel Hugh t. Williams, Indiana Legion, replied that Morgan "must take it by hard fighting."" No major battle occurred, and Morgan's cavalry withdrew toward Dupont, Jefferson County. Vernon platted 1815. 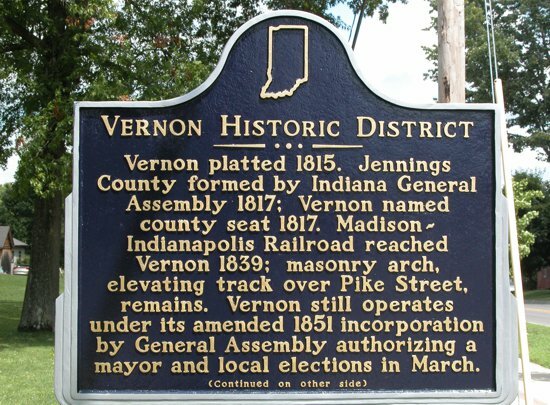 Jennings County formed by Indiana General Assembly 1817; Vernon named county seat 1817. Madison~Indianapolis Railroadreached Vernon 1839; masonary arch, elevating track over Pike Street, remains. Vernon still operates under its amended 1851 incorporation by General Assembly authorizing a mayor and local elections in March. 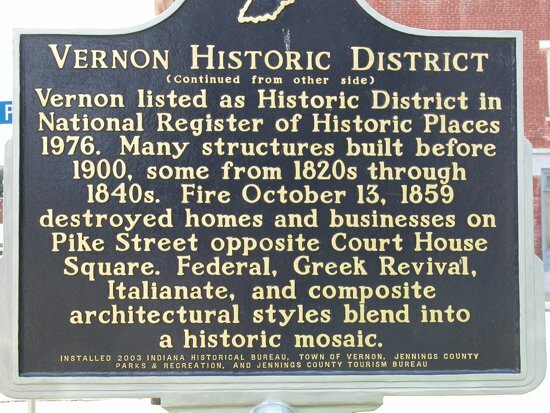 Vernon listed as Historic District in National Register of Historic Places 1976. Many structures built before 1900, some from 1820s through 1840s. Fire October 13, 1859 destroyed homes and businesses on Pike Street opposite Court House Square. Federal, Greek Revival, Italianate, and composite architectural styles blend into a historic mosaic.